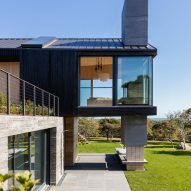 US firms Gray Organschi Architecture and Schiller Projects took cues from the natural terrain of Martha's Vineyard, a vacation island off the coast of Cape Cod, to create this holiday retreat. 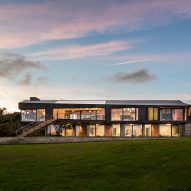 The Chilmark House sits on a 4.25-acre (1.7-hectare) site that is surrounded by farmland and overlooks the sea. 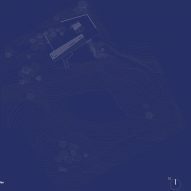 "We worked with the family to search for land for a year before settling on an unbuilt parcel set back from the South Shore," said Schiller Projects, a Manhattan studio started in 2011 by Aaron Schiller. 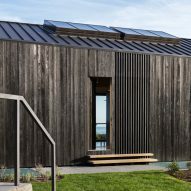 The studio worked with Connecticut-based Gray Organschi Architecture on the project. 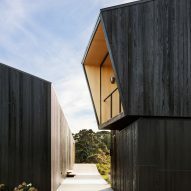 L-shaped in plan, the two-story home is embedded in subtle hillside. 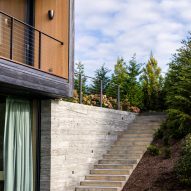 "Wonderfully sloped, the site challenge demanded a delicate balance between the architectural insertion and the natural landscape," the team said. 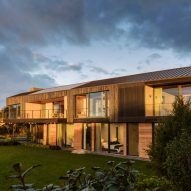 While conceiving the design, the architects looked to an old barn that they viewed as a large mass that did not overwhelm the natural environment. 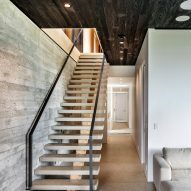 Creating a home that worked in harmony with the terrain was a guiding concern. 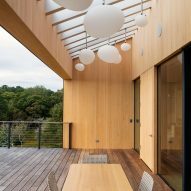 "This landscape-based approach led us toward how best to site and lay out the house – the architectural and landscape process feeding off of and interchangeably leading each other," the team said. 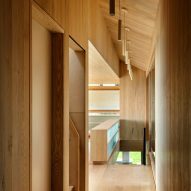 A long entry drive follows the contours of the land, passing through a wooded thicket and arriving at the eastern edge of the home. A stone walkway leads to the front door. 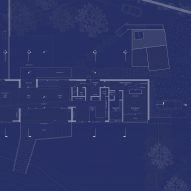 The upper volume extends beyond the lower portion of the home, forming shaded terraces. 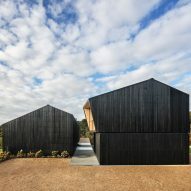 Its cedar cladding was charred using the ancient Japanese technique of shou sugi ban – a method Schiller Projects had used in the past. 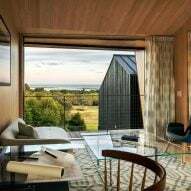 "We had done this previously with furniture and were excited to expand the knowledge learned there to the architectural scale," the team said. 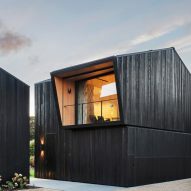 "In the cool sea light, the facade changes from black to white to grey across the day." 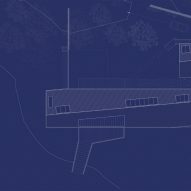 The main public spaces are located in the top level, flowing into each other "without every losing a view of the ocean". 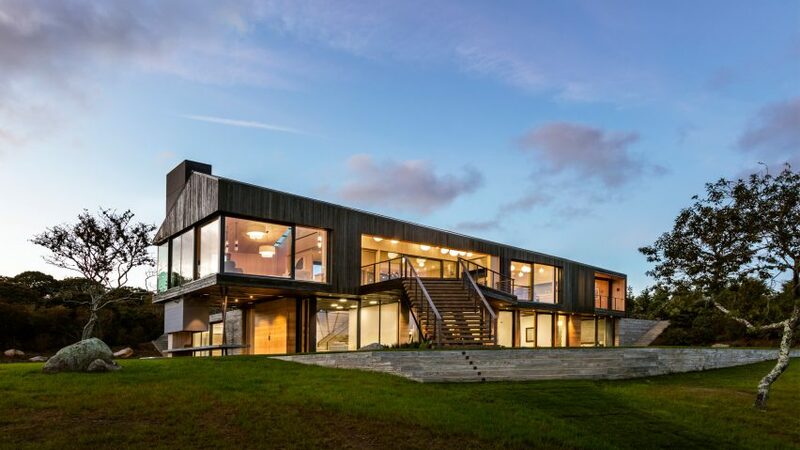 Skylights and floor-to-ceiling glass usher in ample natural light. 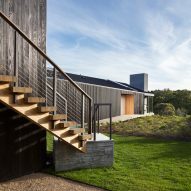 On both the southern and northern elevations, angled wooden staircases lead down to verdant yards. 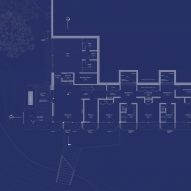 The lower volume contains bedrooms, play spaces, a media room and a gym. 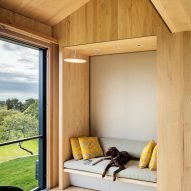 Sitting rooms serve as spaces for reflection and reading. 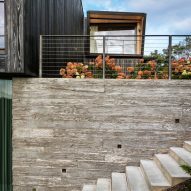 Exterior walls are made of board-formed concrete. 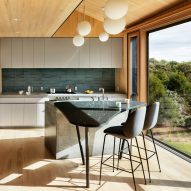 Large windows and glazed doors provide a strong connection to the landscape. 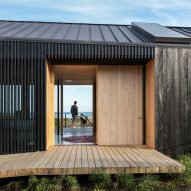 "Almost every room can be entered directly from outside, making sure to ground the house in connection to this place," the team said. 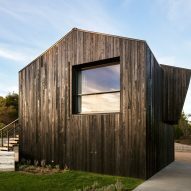 The interior design takes cues from the exterior cladding. 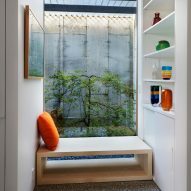 The team used a restrained palette of bleached-ash and bleached plywood, which is paired with pops of colour in the decor. 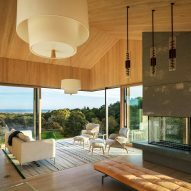 "The interior approach plays off the architectural context much the way the architecture plays off the landscape," the architects said. 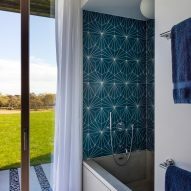 The team designed much of the home's decor, including pendant lights in the living room, the dining room credenzas and buffet, and bedroom furniture. "At the heart of the house lies a giant, hand-carved walnut dining table designed specifically for the space," said Schiller Projects. 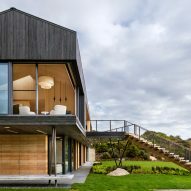 Other dwellings in Martha's Vineyard include a "studio in the trees" by Nick Waldman, and a residence by Peter Rose that consists of eight, interconnected concrete volumes. Photography is by David Sundberg/Esto.